Channel Strip E871, Software channel strip from WSProAudio. WNP Sounds announces the availability of the new full-featured Channel Strip E871 VST plug-in for Windows. The WNP Sounds Channel Strip E871 features a 6-band EQ, each with frequency, Q and gain controls, a three-band stereo compressor, a limiter as well as stereo reverb, delay effects and a modulation section that allows for creating chorus, flange or doubler effects. The compressor also includes a revamped Color control that adds character to the sound, an option filter and a Mix section. A VU-meter is also available. 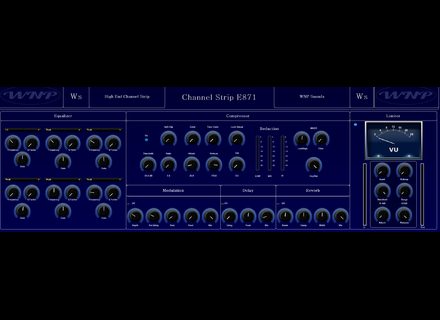 The Channel Strip E871 is a 32-bit VST plug-in for Windows (works in 64-bit with JBridge), it is currently available for the introductory price of $39.99 for a limited time, its regular price is $99.99. You can download a trial version from www.wnpsounds.net. Friday’s Freeware: Ready? Strum! DSK Music offers this week three virtual guitars in a single plug-in for Mac OS X and Windows.